Of all the resources that people depend on, only air is more directly vital to sustaining human life than water. Deprive a person of air, and he dies in minutes. Deprive him of water, and he dies in days. Deprive him of food, and he can go on for weeks or months, depending on his physical condition at the beginning of the fast—and on whether he has adequate supplies of water. Water is essential not only to individual humans, but also to human societies. Yet potable water is an increasingly scarce resource, particularly when viewed against the backdrop of an expanding global population, changing water technologies, and the prospect of global climate change. Humans have long been organized into social groups with more or less clearly defined boundaries within which they conduct their affairs. Water, however, is an ambient resource that neither knows nor respects human boundaries. The world's 261 international river basins, covering 45 percent of Earth's land surface (excluding Antarctica), are shared by more than one nation. * Even the most cordial and cooperative of neighboring nations have found it difficult to achieve mutually acceptable arrangements to govern their transboundary surface waters , even in relatively humid regions where fresh water usually is found in sufficient abundance to satisfy most or all needs. When nations are located in arid regions, conflicts become endemic and intense despite otherwise friendly relations or even membership in a federal union. Little wonder the English language derives the word "rival" from the Latin word "rivalis," meaning persons who live on opposite banks of a river used for irrigation . Water, it turns out, is too vital a resource for nations to fight over. Nations can, and often do, arrange to share the waters of a transboundary basin, thereby minimizing the risks of conflict. Nations have gone to war repeatedly in the twentieth century while carefully protecting each other's water facilities and respecting the promised share of a water allocation. Even in the absence of such arrangements, customary international law provides some simple rules to enable nations to coexist peacefully within a single, shared river basin. Customary international law arises from the practices of nations when those practices are undertaken out of a sense of legal obligation (called the opinio juris ). The resulting law is highly decentralized and institutionally undeveloped, similar to the customary law found among subsistence farmers or nomadic tribesmen. In order to make the evolution of customary international law clear, consider this analogy. Suppose there is a field between two villages, with no road across the field. People initially will tend to wander at will from one village to the next. Gradually, most people will follow a particular line, perhaps the shortest route, or perhaps the easiest route, or perhaps the route most convenient to the heaviest walkers—walkers whose tread wears a path more decisively into the landscape. For whatever reason, a definite path will emerge, and gradually it will become a road. Eventually, all will agree that this road is the only right way to travel from village to village, even though no one can say precisely when this notion took hold. At that point, people will object to others as trespassers if the others choose a different path—by which time a legal norm exists and not merely a factual description of a path. Customary international law, developing through a process of claim and counterclaim between nations, empowers international actors by legitimating their claims while also limiting the claims they are able to make. Finding the appropriate international practice is fairly easy; relevant practices can be found in a consistent set of international agreements, in votes at international assemblies, in decisions by international courts or international arbitrators, or in unilateral acts of nations. Proving that these practices arise from a sense of legal obligation rather than from mere expedience can be more difficult. As a result, international decisionmakers frequently turn to the writings of well-respected scholars of international law for evidence of such intent. Because of the general absence of a neutral enforcement mechanism, international law often has no better method for sanctioning violations than the law of the vendetta. As a result, customary international law by itself has proven unable to solve the problem of managing transboundary water resources. Still, the pattern of national claim and counterclaim, and of national behavior intended to make such claims effective, is consistent and the ultimate outcome, except in cases of strong power imbalances among the nations sharing an international watercourse is, in general terms, entirely predictable. All nations agree that only riparian nations—nations across which, or along which, a river flows—have any legal right, apart from an agreement, to use the water of a river. Beyond that, however, the patterns of international claim and counterclaim initially diverge sharply according to the riparian status of the nation making the claim. The upper-riparian nations initially base their claims on absolute territorial sovereignty, typically claiming the right to do whatever they choose with the water regardless of its effect on other riparian nations. Downstream nations, on the other hand, generally begin with a claim to the absolute integrity of the river, claiming that upper-riparian nations can do nothing that affects the quantity or quality of water that flows in the watercourse. The utter incompatibility of such claims guarantees that neither claim will prevail in the end, although the process of negotiating or otherwise arriving at a solution might require decades. International water law helps enable nations to peacefully share a river basin and the waters it contains. The UN Convention (an international agreement) embraces several principles that will likely become the guiding force in managing international watercourses and resolving water conflicts. theory according to some selected historic pattern of use, although occasionally some other more or less objective measure of need is advanced (e.g., population, area, arable land). At the extreme, the theory of equitable utilization is no more developed than the vague notion that each nation is entitled to a "reasonable share" of the water. That the rule of equitable utilization is required by customary international law is shown by the many treaties based on the concept, by international judicial and arbitral awards, and by the near-unanimous opinions of the most highly qualified legal scholars. The United Nations General Assembly recently codified the rule of equitable utilization in Article 5 of its United Nations Convention on the Non-Navigational Uses of International Watercourses (UN Convention). 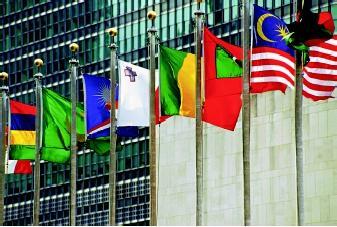 The Assembly approved the UN Convention on May 21, 1997, by a vote of 104–3. Article 5 requires watercourse nations to utilize an international watercourse in an equitable and reasonable manner with a view to attaining optimal and sustainable utilization and benefits consistent with adequate protection in the watercourse. Article 5 also provides that watercourse nations shall participate in the use, development, and protection of an international watercourse in an equitable and reasonable manner. The right to participate includes both the right to utilize the watercourse and the duty to cooperate in its protection and development. The UN Convention also originally embraced a second principle, termed the "no-harm rule," in its Article 7. Article 7 was very controversial during the drafting process because it seemed to contradict the rule of equitable utilization in Article 5. The final version of Article 7 makes clear that the "no-harm rule" is subordinate to the rule of equitable utilization. Article 7 requires watercourse nations, in utilizing an international watercourse, to take all "appropriate measures" to prevent the causing of significant harm to other watercourse nations. If significant harm nevertheless is caused to another watercourse nation, the nation whose use causes such harm must, in the absence of agreement for the use, take all appropriate measures, having due regard for the provisions of Articles 5 and 6 (equitable utilization) in consultation with the affected nation, to eliminate or mitigate the harm and, where appropriate, to discuss the question of compensation. When the UN Convention comes into force (after 35 ratifications), it will unquestionably be the law governing internationally shared fresh waters at least among those nations ratifying it. It appears to be an accurate statement of the international customary law as well. This reading was confirmed by the International Court of Justice in its ruling on the Danube River Case (Hungary v. Slovakia) in 1997. * The Court's opinion referred twice to the rule of equitable utilization and did not mention the "no-harm rule." The Court's failure even to mention the "no-harm" rule despite Hungary's heavy reliance on the principle in its pleadings confirms that the rule of equitable utilization is primary, and that avoidance of harm is to be considered only in analyzing whether a particular use or pattern of use is equitable. The availability of alternatives, or corresponding value, to a particular planned or existing use. Non-lawyers, particularly engineers and hydrologists, sometimes see in this list of factors a poorly stated equation. By this view, if one simply fills in numerical values for each factor, one could somehow calculate each watercourse nation's share of the water without reference to political or other non-quantitative variables. However, the UN Convention is a legal document that ultimately is addressed to judges. Judges make judgments, and in English at least, the word "judgment" carries a strong connotation that the result is not dictated in any immediate sense by the factual and other inputs that the judge relies upon in exercising judgment. In short, any attempt to treat the list of relevant factors as an equation simply misses the point entirely. Thus, even when each interested nation always agrees to the rule of equitable utilization, nations would still dispute what should be the common standard for sharing and the proper application of the agreed standard. The rule of equitable utilization is simply too general and too vague to be applied without the interested nations filling in the details in what remains merely an obligation of fairness. Yet without a legal resolution of disputes over water, the disputes can only lead back to the law of the vendetta. Serious conflict in one form or another cannot be avoided under the rule of equitable utilization without a clear definition of the precise standards for managing the shared waters and a peaceful mechanism for the orderly investigation and resolution of the disputes characteristic of the rule. Most disputes over international river systems thus have eventually led to a treaty based on equitable utilization, and several hundred such treaties now have entered into force regarding internationally shared waters. The treaties reflect not only logic, but also need and power. Groundwater has emerged as a critical transnational resource. Groundwater comprises about 97 percent of the world's fresh water (apart from the polar ice caps and glaciers ). But despite its transnational nature, groundwater and its sharing has received little international attention relative to the sharing of surface waters. The UN Convention limits its application to underground water either tributary to, or sharing a common terminus with, surface waters covered by the document's Articles. Yet nations need to develop treaties to ensure the equitable utilization and management of internationally shared groundwater basins. Because hydrologic, economic, and engineering variables are essentially the same as those of surface waters, the principles regarding shared rivers likely apply to shared aquifers . The United Nations system has only begun to address the international legal issues relating to groundwater, as evidenced by the resolution of the International Law Association in 1994 calling for more study of the law governing the use of groundwater. International water law is a complex topic, which grows increasingly important in a water-scarce world. Nations will continue to struggle to manage their transboundary resources and international agencies will continue to develop an integrated system of water law to guide them in this endeavor. As management challenges evolve, so too will international water law. SEE ALSO Hydropolitics ; International Cooperation ; Law, Water ; Transboundary Water Treaties . Beach, Heather et al. Transboundary Freshwater Dispute Resolution: Theory, Practice, and Annotated References. New York: United Nations Publications, 2000. Dellapenna, Joseph. Middle East Water: The Potential and Limits of Law. The Hague, Netherlands: Kluwer Press, 2002. Wouters, Patricia, ed. Codification and Progressive Development of International Water Law: The Work of the International Law Commission of the United Nations. London, U.K.: Kluwer Law International, 2002. Convention on the Law of the Non-Navigational Uses of International Watercourses, 1997. <http://www.un.org/law/ilc/texts/nnavfra.htm> . International Water Law Project Website. <http://www.internationalwaterlaw.org/> . The Nile Valley nations perfectly epitomize the scenario set out in the text regarding the role of customary international law in resolving international disputes over water. Egypt is not a wealthy nation; its per capita gross domestic product is only US$630/year, making it one of the poorer nations in the Middle East. Yet Egypt is wealthier than Sudan (US$540/year), and Egypt and Sudan are far wealthier than Ethiopia (US$120/year). As is commonly the case throughout the world, the lower basin nations are wealthier and more highly developed than the upper basin states. Yet without a common border, Egypt cannot easily pose a military threat to Ethiopia or otherwise set about to impose its will directly. Ethiopia, on the other hand, gets the water first. One might think, therefore, that Ethiopia is in a position simply to do as it chooses, regardless of the effect on downstream states. Ethiopia, however, is too poor and too poorly organized to construct the dams and related infrastructure necessary to exploit the Blue Nile without outside financial assistance. Egypt has succeeded in exploiting its greater political importance to block international financing of Ethiopian dams and related works. As part of this diplomatic program, Egypt has freely deployed legal arguments, particularly the so-called no-harm rule. Egypt most recently did not object to a loan application by the Ethiopians for a small-scale irrigation project, suggesting that there might be some truth to rumors of a secret agreement between the two nations regarding development of the Nile. Priority of Use. Ultimately, Egypt claims an absolute right to the integrity of the river because of the priority of their use. Priority of use, while undoubtedly relevant to an equitable allocation of water among national communities, has never been treated as absolutely controlling in international law. Any other approach would negate the concept of "equitable utilization" that is the rule of customary international law. Furthermore, for priority in time to override all other values, or even to dominate other values, would hardly be conducive to achieving the developmental equity proclaimed under various banners at the United Nations. To accord such priority to existing uses in the Nile Basin would condemn Ethiopia to remain impoverished and dependent on international food aid to stave off mass starvation, for the benefit of the relatively richer Egyptians and Sudanese. In the Jordan Valley, this approach would condemn the Palestinians to remaining a colonial society utterly dependent on Israeli largesse, and would leave the Jordanians only marginally better off. The tension between protecting "historic rights" and providing for developmental equity can be managed only if the water is cooperatively managed by the several national communities in such a way as to assure equitable participation in the benefits derived from the water by all communities sharing the basin. Customary international law, in its somewhat primitive state of development, cannot by itself resolve the management problems of a region. While uncertainty of legal right can induce cooperation among those sharing a resource, it can also promote severe conflict. Nor can a partitioning of the waters be an adequate resolution when there simply is too little water to divide. To create the sort of regime necessary to allay conflict and optimize the use and preservation of the resource of the Nile will require a new treaty, one that includes all basin communities, creates appropriate representative basin-wide institutions, and has the clout to enforce its mandates. International practice provides numerous examples as models for institution design. As of early 2003, the UN Development Programme was promoting the negotiation of such a treaty for the Nile. * See "Hydropolitics" for a map of major international river basins. * See "Transboundary Water Treaties" for a photograph related to the Danube River case involving Hungary and Slovakia. Cannot we make a simple law the shairing country of a river must use the percentage of water flow as much percentage of river travels in their respected country. Simple laws with unbias implimentation can bring peace and prosperity among nations and the world at large.